Our local workers comp attorneys fight for Ohio’s workers. 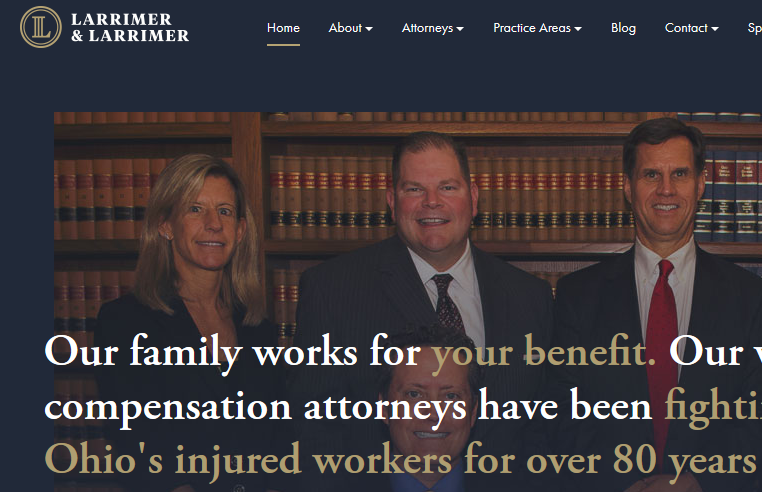 At Larrimer & Larrimer, LLC, helping our clients obtain the best possible results with their workers compensation concerns is our first priority. Our attorneys, legal assistants and staff members strive to understand each client’s individual circumstances in assessing problems and proposing solutions. Most importantly, we will always be there when you need us. Developing long-term relationships with our clients is one of the most important traditions we established in our nearly 90-year history of practicing exclusively with Ohio workers compensation laws. We know you work hard on the job. Your case is unique, and we should treat you like a person, not a claim number. Whatever your individual needs – whether your case demands aggressive litigation or mere oversight and monitoring – you can rest assured that our Columbus workers compensation lawyers will do their utmost to protect your rights, maximize your benefits and obtain the results you need for your recovery and your peace of mind.